The weather in the first two days of regattas was not so good and permitted to complete only one Round Robin and 7 flights of the Second so today we had to rush for finishing the Eurosaf Match Racing Open European Championship. Firstly were assigned the positions from 5th to 12th place (with format of King of the Castle), then the four finalist teams competed in semifinals, petite final (3rd and 4th place) and the final. First Semi-Final was between the French Team of Maxime Mesnil with Yann Chateau and Yves-Marie Pilon and the Speaky Match Racing team of Afonso Leite with Diogo Pinto and Nuno Bajanca from Portugal. Mesnil beat Leite for 2-0. The second Semi- Final was between Team Abenius Match Racing of Victor Abenius with Robin Axelsson and Fredrik Thomra from Sweden and Lumba Match Race Team of Dejan Presen with Miha Truden and Jure Jerkivic from Slovenia. The Slovenian team beat Swedish Team 2-0. For the Petite Finale the fight was between Swedish Victor Abenius and Portuguese Afonso Leite, who won 2-0 and went on podium as 3rd ranked. Grand Final was between Maxime Mesnil and Dejan Presen. 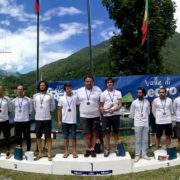 After scored 2-0 the European Champion of the Eurosaf Match Racing Open is Maxime Mesnil. Huge Congratulations to all the teams, soon we will updated the photos and video.